Video website YouTube and social networking site MySpace are among the 50 "coolest websites" of the year as chosen by US magazine Time. The magazine breaks its choices down into categories including entertainment, shopping and news. "We evaluate hundreds of candidates - some suggested by readers, colleagues and friends," said Time reporter Maryanne Murray-Buechner. The magazine has kept an annual list since 2003. Three years ago websites such as Ebay, Hotmail, Paypal, Google and the Internet Movie Database made the list of honour. It's the place where web stars are born, music and film careers are launched and some single people manage to find mates," said Time of MySpace. The social networking site now has 100 million registered users, according to Time. Digg, the website which lets people rank news items from other parts of the web, was one of the magazine's pick of 2005 as was Kevin Sites' chronicle of conflict zones around the world which is hosted by Yahoo. "Veteran war correspondent Kevin Sites, known for his deft use of digital newsgathering techniques and compelling narrative style, continues his work covering conflicts in all parts of the globe," wrote Time. Many of the websites chosen for 2006 are examples of so-called web 2.0 sites, which give users tools to create and share content online. They are "next-generation sites offering dynamic new ways to inform and entertain, sites with cutting-edge tools to create, consume, share or discuss all manners of media, from blog posts to video clips," wrote Maryanne Murray-Buechner. Other sites to make the list include music service Pandora, which creates a personalised online radio station based on music preferences, Meebo, an online instant message service, Google spreadsheets, smart search engine Accoona and Pixsy, a visual search engine combining video and stills. What are the coolest websites you have discovered in the last 12 months? Have you used any of the 50 selected by Time? I have used http://www.ukauthors.com for about 2 years to help me with my creative writing. It has a wonderful community feel about it and probably more facilities than any other writers site. I have cruised My Space and Youtube. I think that FARK should be on the list for news. Is the second best site worldwide for news after the BBC. Julian Cope's website - www.headheritage.co.uk - is cool for two reasons: the UNSUNG section is the best please on the internet for discovering underground music (see Julian's "Album of the Month" - he is always two years ahead of even the underground press with his choices, plus contributors' reviews plus forums); and the MODERN ANTIQUARIAN section, which is the most comprehensive portal for megalithomaniacs. Sure there's a shop where you can buy Julian's latest albums, but he's using the internet in a really exciting and (as he would say) forward-thinking way. No "Dead Man Walking" for one of this nation's true cult treasures! One of the coolest for me is stumbleupon.com which allows you to register and then surf random websites based upon your interests. Plus it allows you to run a blog. NewsNow is also an excellent website for up-to-date news feeds on a multitude of topics and from al over the world. As for YouTube... a word of warning to anyone using it that the terms and conditions state than any and all content you upload to the site, ends up as YouTube's. They can sell it, re-distribute it and do what they like with it. Similar thing was happening with MySpace until Billy Bragg made a fuss and got the site's terms and conditions changed. Pandora is pretty good, but in the past year Last.FM has been a lot more imporant and fun. 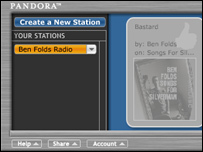 The simple fact that its nerdy too makes it way more fun than pandora...and its not in flash! I cannot believe that lonelyplanet.com didn't make it into the travel section. A growing community of 300,000 active users and countless anonymous others can't be wrong. Have they tried the podcasts for example, or the bluelist aka "10 things you should do in..." sections? This top 50 may be all very well, but it's awfully US-centric. Yahoo Answers. It is a informative website where you can gain answers to questions you didnt know the answer to, and you can also make online friends. It shows how much the web is changing every year when streaming website are starting to creep more and more up these charts. I love youtube.com it is great for streaming music videos and such and i feel tv on demand is just round the corner from these sites. Oh dear. I've only been on two of those sites in the last 12 months (YouTube and MySpace) and I wasn't that impressed with either of them. Either I'm a lot less cool than I'd previously imagined (and believe me, I don't think I'm that cool) or these sites are mainly focused toward an American audience. Give me slashdot.org, theregister.co.uk, theonion.com and the good old news.bbc.co.uk sites any time. www.facebook.com is by far the coolest website at the moment. It has already swept across American universities and is now taking over England!!! Students thought it was hard enough to pass their degrees without this distraction too. I've found that www.rathergood.com is highly amusing and is always guaranteed to make you smile. I love youtube.com so much! It's great as a music video jukebox as you can watch whatever takes your fancy! As well as great fan rarities like live performances etc My other favourite site is wikipedia which is outstanding! I use www.bitefinder.co.uk all the time for finding new takeaways near me. Even got menus on in some areas (including mine) which is really handy! My website of the year is neowin.net, after a massive facelift and a major overhaul of their news services this site is my one stop shop for all of the webs technology news. Their community is excellent too, and is a great safe place to chat and feel like your among friends. I love films and my favourite movie sites are rottentomatoes.com and UKHotMovies.com - both have masses of regularly updated content and what I like about the latter is everything is for a British perspective. I really like kingnutter.com - it's a website that links to all the weirdest auctions on eBay. It even archives any that have been 'pulled'. It's also got some cool comedy and animation on. I also like b3ta.com as it links to the best stuff on the web. One of the best websites that I have used in the last 12 Months is the BBC News. I don't need to say any reason why, you're already looking at it.